Sub : Recording of higher academic/educational qualification in the Service Record of employees recruited through RRBs. 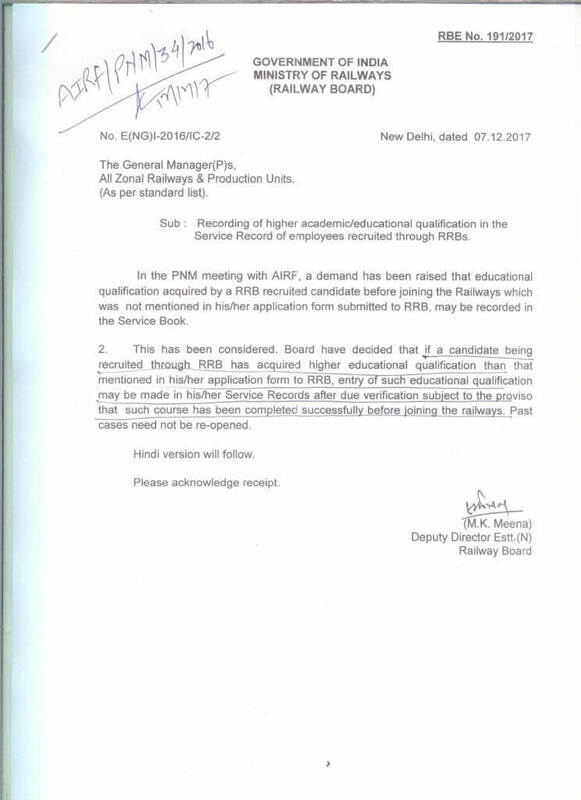 In the PNM meeting with AIRF, a demand has been raised that educational qualification acquired by a RRB recruited candidate before joining the Railways which was not mentioned in his/her application form submitted to RRB, may be recorded in the Service Book. 2. This has been considered. Board have decided that if a candidate being recruited through RRB has acquired higher educational qualification than that mentioned in his/her application form to RRB, entry of such educational qualification may be made in his/her Service Records after due verification subject to the proviso that such course has been completed successfully before joining the railways. Past cases need not be re-opened. Railway Board have decided that if a candidate being recruited through RRB has acquired higher educational qualification, entry of such educational qualification may be made in his/her Service Records after due verification.